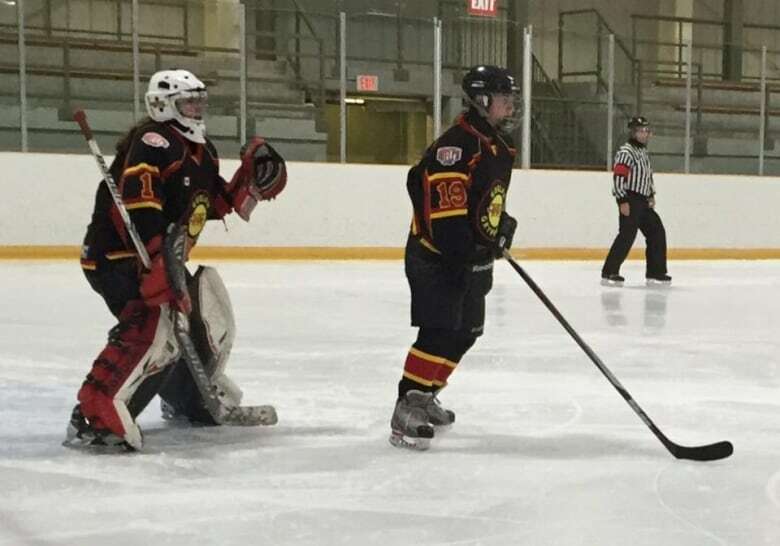 Neck guard saves young hockey player from P.E.I. A young hockey player from P.E.I. is thankful to her coaches, who always insisted that she wear a neck guard and wear it properly. 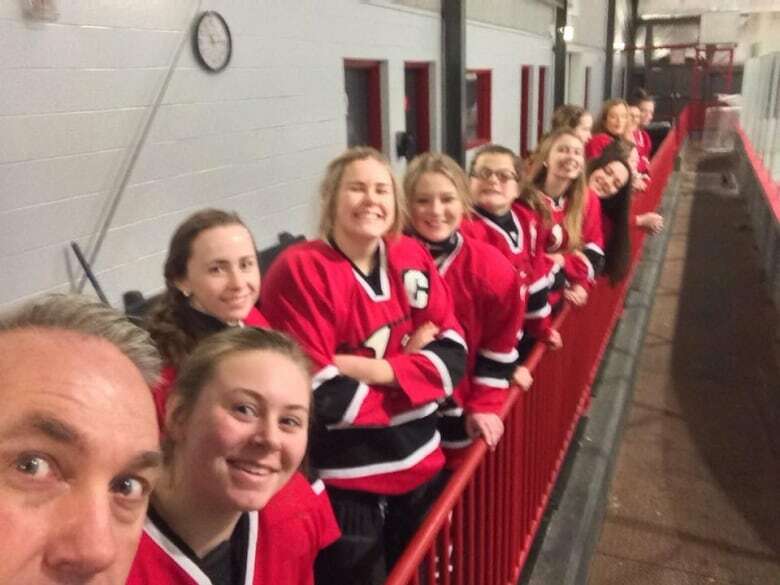 Growing up playing for the Pownal Red Devils, Cassidy Gordon, now 16, always had extra neck guards in her hockey bag, as did her coaches, "because it was a really big deal to make sure that we had our necks protected," she said. That emphasis on safety may have saved Gordon's life after an incident in a hockey game on Nov. 4 that landed her in hospital. A doctor told her the injury could have been fatal. 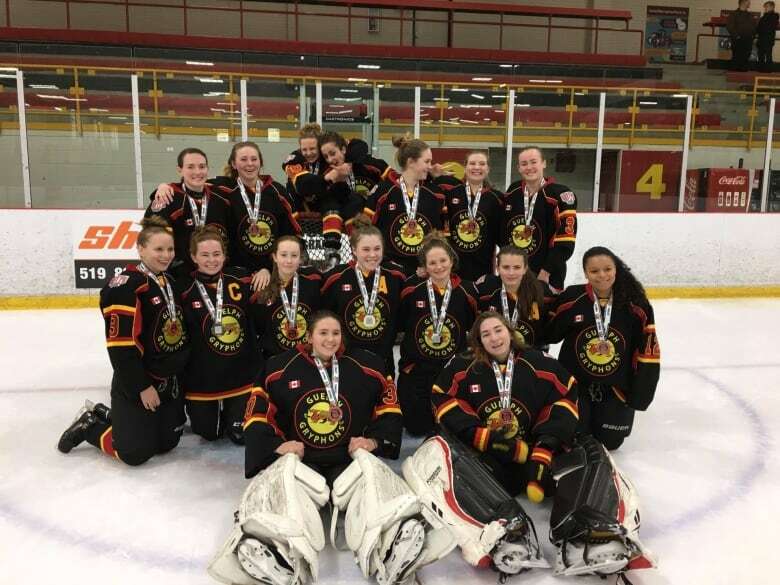 Gordon was playing defence for the Guelph Gryphons, a team she had just joined in September after her family moved from P.E.I. to Ontario. As she was skating out of her end, a girl fell in front of Gordon. That's the last thing she remembers, as the player's skate hit Gordon directly in the neck guard. "After that my memory is just me being on the ice for a long time and then being in the ambulance," recalled Gordon. She arrived at the hospital, still in full gear, including her skates. "There was no blood at all, the skate hit the neck guard, right where my neck was and so it didn't cut me at all." She overheard the doctor explaining how much worse the injury could have been. "He was talking to my mom and said that if the skate had hit me anywhere else or if I wasn't wearing a neck guard, then he would have been having a completely different talk with her," said Gordon. "It's still scary to think about it now, just thinking about what could have happened, if I hadn't been wearing it." There was some damage. A hematoma formed on her neck, which blocked off her vocal cords and airways on one side. Because her face wasn't getting enough oxygen, a lot of blood vessels in her face popped. 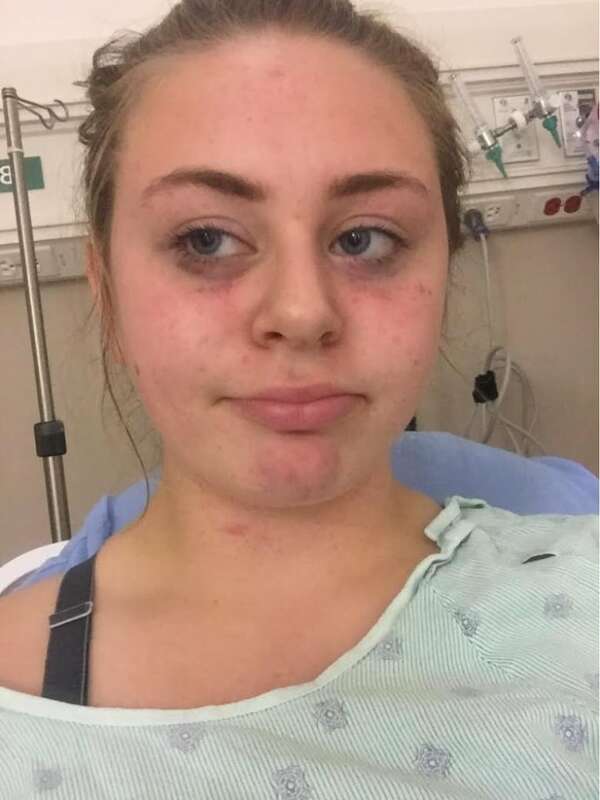 She only noticed the injuries to her face when she began to send a photo to her teammates to reassure them that she was fine. "My face looked like a mess so that was pretty scary." 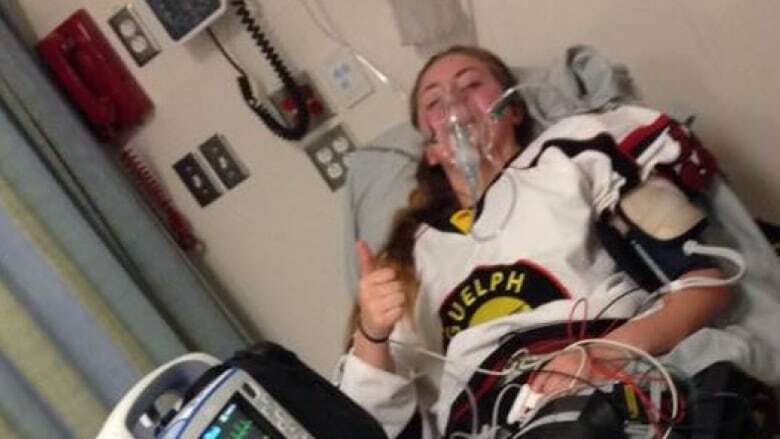 Phil McKenzie, coach of the Midget A Guelph Gryphons, described what happened to Cassidy as the "greatest nightmare." "She was coughing like there was something in her throat," McKenzie recalled. "Cassidy's a pretty tough kid and so for her not to get up, and to watch what she was going through, what sounded like trying to clear her throat, then everyone started to understand what she was dealing with." McKenzie said there were lots of hugs when Cassidy came back a week after the injury. And he has no doubt that, for his team at least, neck guards will always be securely fastened from now on. "At the beginning of the season, a couple of the girls came out to practice and didn't have their neck protectors on," said McKenzie. "And even a few weeks into the season, I still needed to remind a few. "After what happened to Cassidy, I don't suspect that, for that group of girls, that they'll ever need to be reminded again." Gordon admits she was initially hesitant returning to the ice, but now she's "same as I ever was.
" Back to being an aggressive player, good on the ice," she said. She still wears the same neck guard. "No damage at all to my neck guard," she said. "I still use it in games." She hopes her story may convince a few young hockey players to pay more attention to the way they wear their neck guards. "No matter how stupid or not cool you think it looks, it's definitely an important thing to wear because it's the difference between having an injury that can end your career, even your life, and just being safe," said Gordon. MORE P.E.I. NEWS | 5 challenges of fighting fires in the winter on P.E.I.